The Captain's Choice is designed to meet the demanding needs of our professional customers. A progressive, semi-rimless frame design provides ample field of view while wide temples and a sun-shielding 8-base wrap provide all-day glare protection. Megol nose pads and our new temple pads with integrated detachable sunglass leash ensure a secure fit and peace of mind whether you're out on the flats or far from the coast. 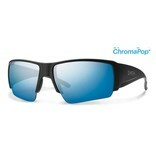 Available in all six of our premium ChromaPop™ lens tints, the Captain's Choice is there for you no matter the path taken.